Back to having the card I need so a completed one today. I have been looking at stuff I bought and never used. Well before the advent of Perfect Pearls, I had acquired many, many pots of Pearl-Ex. The big difference is PPs have the binders already added so you can mix them with water and create a “paint” – Pearl-Ex is not permanent when mixed with water. It is if you, for example, stamp with Versamark and then dust it on. 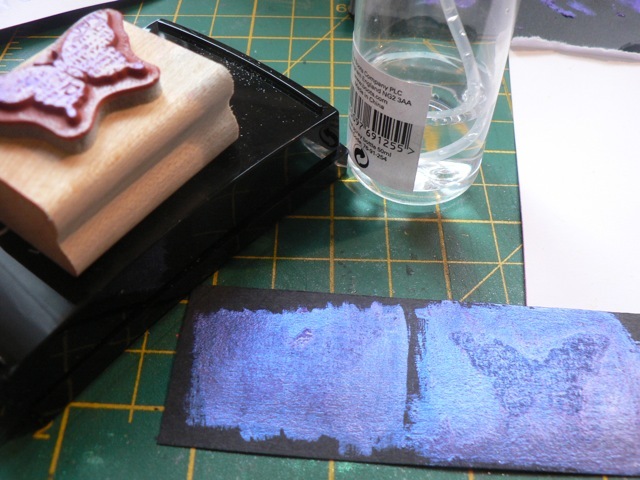 The ink will trap the Pearl-Ex and bind it so it won’t rub off (well, not much) and you can mix it in to just about anything – I’ve tried it mixed in to Liquid Pearls, for example, and that works a treat, as does gloss or matte medium. You can mix it into Fimo too. But you can’t make mist with it as it won’t stick once the water dries. 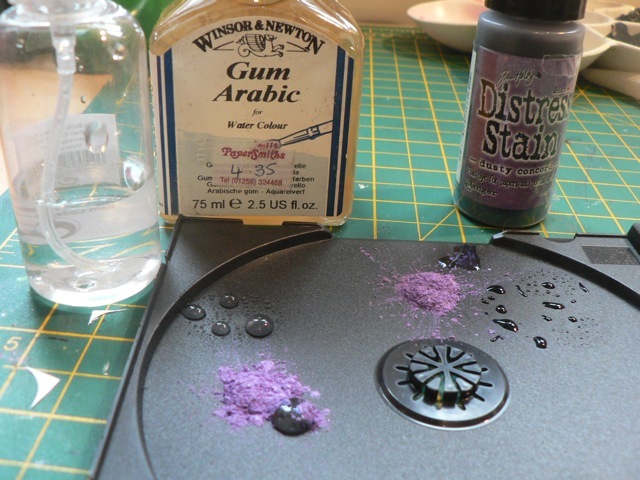 Eons ago, I bought Gum Arabic, after reading on the Jacquard site that you could mix it up with Pearl-Ex to, essentially, make Perfect Pearls. Of course at the time I only saw LIQUID Gum Arabic and have since found you can buy it in powdered form. That seems like it would be easier. Anyway, I wasn’t going to go out and buy powdered when I had a huge bottle of liquid. So I had a play. I mixed up a drop of gum arabic, about 4 x as much Pearl-Ex, and mixed it up with a spritz of water. It made a lovely creamy paint. But then, I had the idea of mixing in some dye ink to intensify the colour. Look at this – all three dots started from the lightest colour pink. The HOT PINK was achieved by adding a drop or two of bright pink dye ink to the mix. The more red colour, had red dye ink added. Then I thought of what else I had and grabbed the Fired Brick Distress stain. That got the less-red dot in the middle of the lightest pink. First let me share the card, then I’ll carry on with my Mad Scientist impression. 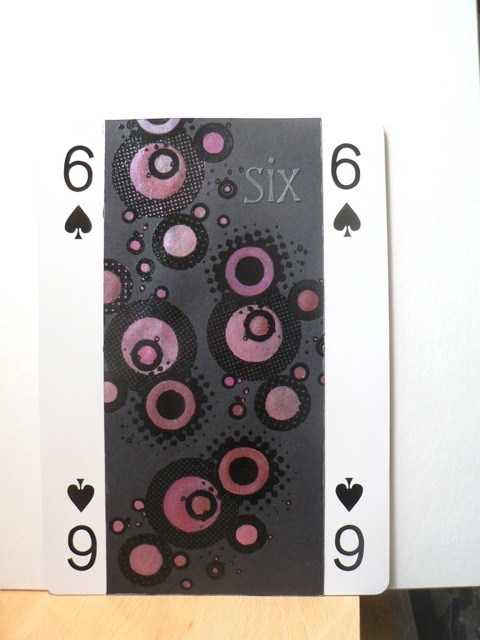 The very dark silver/grey SIX was a mix of pewter Pearl-Ex with a drop of permanent black ink – it was the only liquid black ink I had on hand. It worked, but dye ink would perhaps have been better. Now, thinking on the properties of Distress, that it is reactive with water, I tried a little experiment. I don’t think you will see the difference, due to the shine of the mica but the right is def. darker, deeper purple in real life. 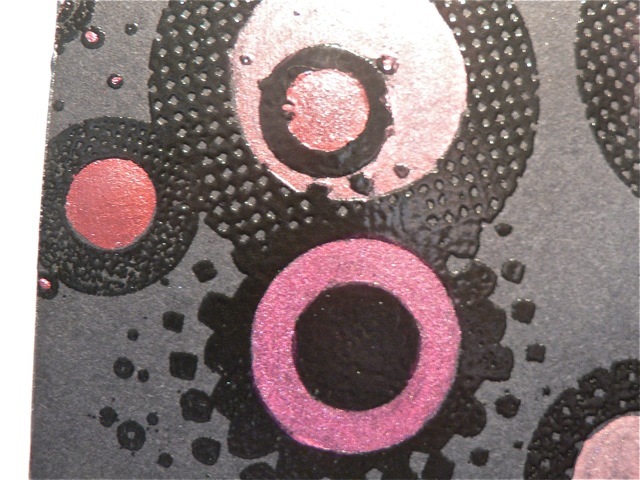 Not as much as the DYE ink ones – that is startling in its intensity, which I hope you can see in the pink dots above. OK, so all well and good. But it was the reactive-with-water bit I was interested in. 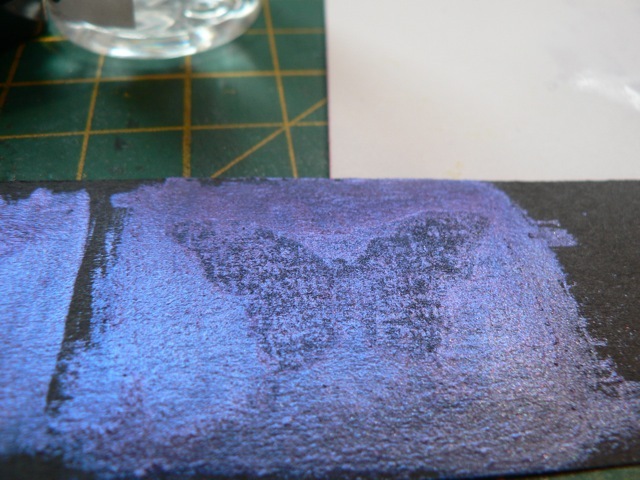 So I inked a stamp with Versamark and then tapped it in a spritz of water. I stamped on the non-Distress blob and then inked (Versamark and water) again and did it on the side with the Distress added. Can you see how much more the with-Distress side reacted with the water? Cool humm? to be fair this was quite a detailed little stamp, with text on the wings. It just happened to be the right size and on my desk, so it ended up a pretty indistinct image. But I think there is the potential here for some interesting effects. The mixture will dry out, but you can then simply drag your water brush through and…re-activate it, I guess. Just like Tim shows in his book when making paint palettes with PPs. I also think if you already have Perfect Pearls, you might try mixing up the powder with Distress stain rather than water and see what happens. I am imagining painting squares with the mix then stamping in with the Versamark and water, for something like inchies, IYKWIM. Might make a pretty tiled card or addition to a configurations box. 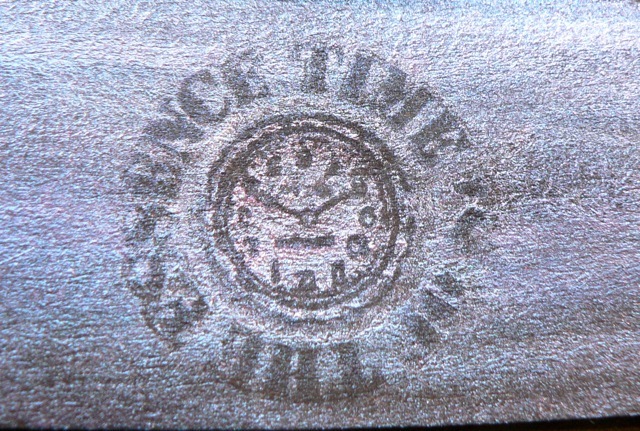 And I wonder if you were to ink with BLACK ink, then water then stamp would you get an interesting effect? Maybe on white cardstock instead? So much to try, so little time LOL! Have a bash. Comment with a link to your projects (or add it as your site in the form if you can’t add a link in the actual comment) LMK how it turns out in any case. I just wanted to add this one – a better stamp choice and it looks very cool IRL! 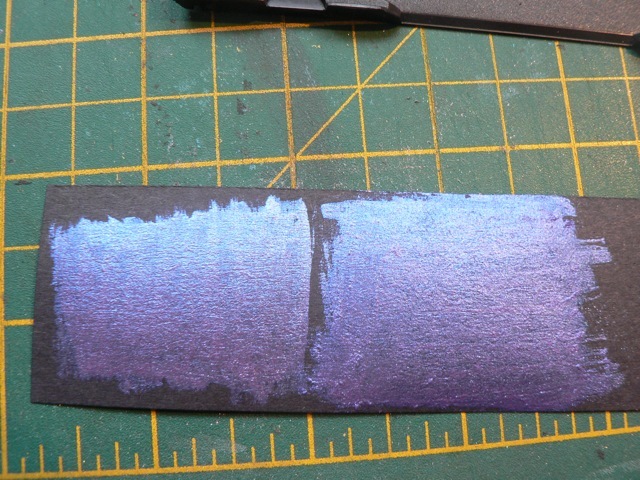 This was with a thinner brushing on of the mixture so when stamped the black cardstock was revealed more fully. I also hit it with the heat gun briefly. Categories: art, BIG CARDS, tutorial | Tags: cards, distress stains | Permalink.